Unfold the pastry sheet on a lightly floured surface. Cut the pastry sheet into 3 strips along the fold marks. Place the pastry strips onto a baking sheet. Bake for 15 minutes or until the pastries are golden brown. Remove the pastries from the baking sheet and let cool on a wire rack for 10 minutes. Split the pastries into 2 layers, making 6 in all. Place 6 squares chocolate and 1/4 cup heavy cream into a medium microwavable bowl. Microwave on MEDIUM for 30 seconds. Stir. Repeat until the mixture is melted and smooth. Let cool to room temperature. Beat the remaining cream in a medium bowl with an electric mixer on high speed until soft peaks form. Fold half the whipped cream into the chocolate mixture. Fold in the remaining whipped cream just until blended. Reserve 2 top pastry layers. Spread 1/2 cup chocolate mixture and 1/3 cup strawberries on each of the remaining pastry layers. 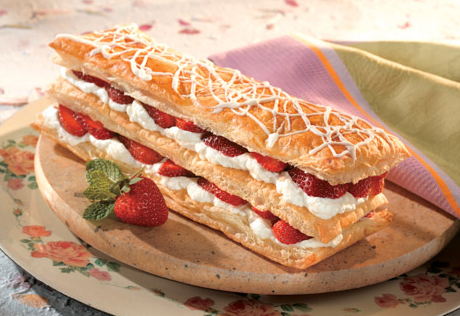 For each dessert, assemble 2 layers and top with 1 reserved top pastry layer. Melt the remaining chocolate and drizzle on top. Serve immediately or refrigerate for up to 4 hours.